Terriers look to return to the winning column as they begin a home-and-home with UMass-Lowell at Agganis Arena tonight. Puck drop is at 7:30 for the contest that will be live-streamed on TerrierTV. The BU Student Athlete Advisory Committee (SAAC) will hold its 14th annual Teddy Bear Toss during Friday's game. Teddy bears will be sold at the game for $10 each with all proceeds donated to local pediatric charities. Fans are also allowed to bring new stuffed animals to the game to throw onto the ice during the second intermission. The River Hawks have a 7-6-1 record (3-3-1 in Hockey East) after last weekend’s split with RPI. Their offense is led by two juniors Ryan Lohin with 11 points and Kenny Hausinger with 10. Goalie Tyler Wall has the conference’s best GAA at 1.80 and the second best save percentage, .933. 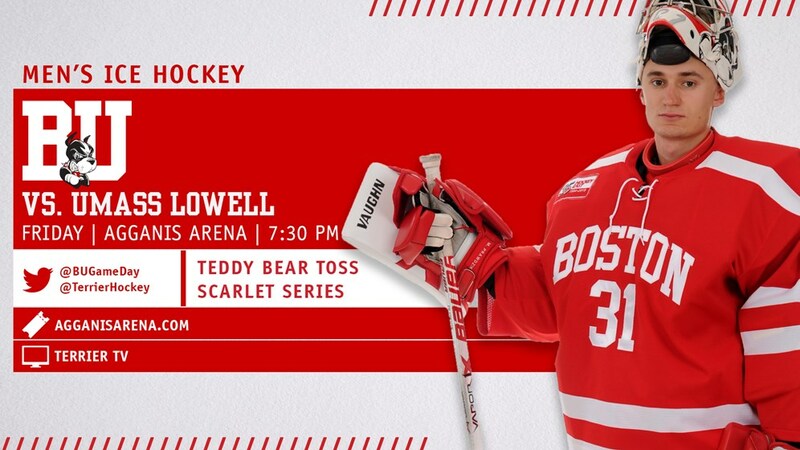 ►The Friends of BU Hockey Lounge will be open following the game to all FOBUH donors. And, the Terriers' annual Skate with the Men's and Women's hockey teams will be this Sunday at Agganis Arena from 1 to 3 p.m. Complimentary skates will be available. Free parking in the Agganis Arena garage. Enter the arena via the Feld Public Skating entrance located on Harry Agganis Way. Rosters for pre-tournament camps have been announced and four Terriers heard their names called. Sophomore Logan Cockerill and freshman Joel Farabee will head to the Team USA camp, while sophomores Shane Bowers and Cam Crotty will compete at the Hockey Canada camp. ►Episode 8 of Inside BU Hockey features Bernie Corbett’s interviews with Head Coach Albie O’Connell and UMass-Lowell play-by-play announcer Bob Ellis. 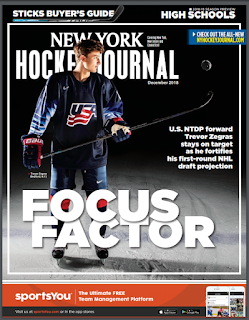 2019 recruit Trevor Zegras, who has seen his NHL draft stock shoot up, is featured on the cover of—and is profiled in—the December issue of New York Hockey Journal. The 6’0” left-shot forward from Bedford, NY, who is currently second in scoring on the NTDP 18s with 35 points in 22 games, discusses his reasons for committing to BU and his personal development goals for this season. ● McKeen’s Hockey draft profile. 2019 recruits Robert Mastrosimone and Ethan Phillips have been selected to play in the USHL Top Prospects Game set for January 8 in Lincoln, NE. Mastrosimone (17 points in 17 games for Chicago Steel) recently joined the NTDP U18s for the Five Nation’s Tournament in The Czech Republic. Phillips, who recently joined Sioux Falls after beginning the season with Selects Academy, has 11 points in his first seven games with the Stampede. 2019 recruit Liam Gorman scored twice and added an assist, while 2020 recruit Liam Connors had a goal and two helpers to lead St. Sebastian’s to an 8-4 win over St. Marks. 3-1 win for Lawrence over a Milton team that gave it all it had. Best player on ice tonight was ‘19 NHL Draft prospect Braden Doyle (BU) who was a possession machine and had GWG with 9:42 left in 3rd. Doyle, who played in September's All-American Prospects Game, is a 2020 Terrier recruit. 2021 recruits Roman Schmidt (Don Mills Flyers) and Danny Zhilkin (Toronto Marlboros) have been named to play in the Greater Toronto Hockey League Top Prospects game next month. Both are projected to be first-round picks in the OHL Priority Draft. A trio of Terriers who were teammates on BU's 2015-16 squad were in last night's Bruins' line-up: forward Jakob Forsbacka Karlsson and defensemen Matt Grzelcyk and Charlie McAvoy. Boston dropped a 3-2 decision to Tampa Bay. Jack Eichel scored a pair of goal in Buffalo’s 4-3 overtime loss to Toronto. Matt Nieto scored a short-handed goal (video) in Colorado’s 6-3 loss to Pittsburgh. Following their first-ever weekend sweep of BC, the Terriers are on the road for a weekend series at RIT in Rochester. Puck drop today is at 2 p.m. and tomorrow at Noon. Sophomore Jesse Compher leads BU with 24 points, while red-shirt junior Sammy Davis has 20.